Après son exploration de l’immensité avec son 2500 pi2 labyrinthe d’installation Indigo Griots – Labyrinthe dans le cadre d’enAvril de l’année dernière, cette année, Valérie étudie les minutiae imprégnés dans les moments de création et l’examen des possibilités ..
Entités …… tenant sur la prise accidentelle…caché dans des espaces liminaires nous sauter par-dessus, sur le chemin de quelque part d’autre…. ce qui se passe si nous nous arrêtons et prenons un long regard sur l’autre? Entités arrêter dans m’atelier, s’arrêtant un instant ou deux … elles me toucher… sur leur chemin vers un autre Ètat d’Ètre…. At the age of the internet we have a different consciousness of the human in some respects. The world becomes a global village. What happens to the Quebec identity in this new paradigm? With the emergence of a culture that transcends nations, local culture is questioned. What is involved? Immigration, trade, social media? French, in Quebec, represents our roots, but in a society where the pace of technological advancement is exhausting which language takes the lead? Mandarin, JAVA, Spanish, English, C + +? In the installation C: \ \ we explore aspects of Quebec’s identity through the juxtaposition of traditional crafts to new media. Embroidery, weaving and dyeing rub up against programming language and an interactive sound environment. 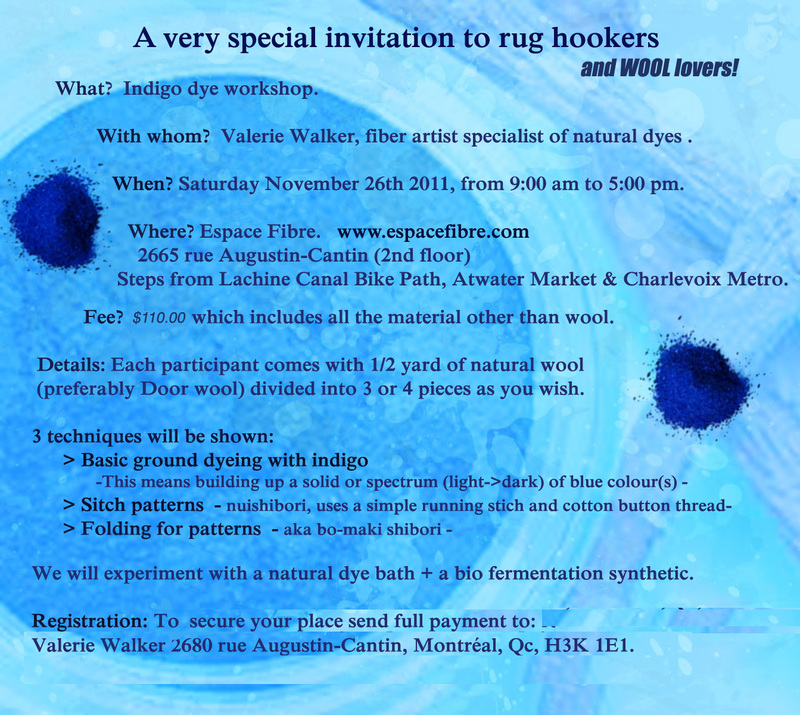 Exposition: Indigo Griots: Tales of an urban dyer – Montréal by Valérie d. Walker. 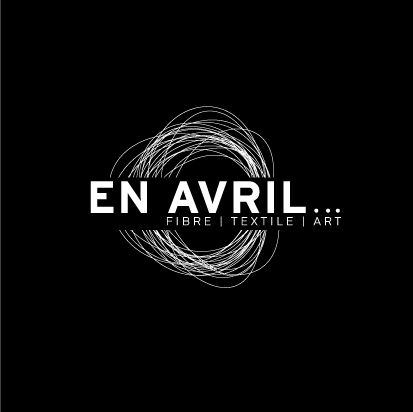 Indigo Griots: Montréal is an intermedial (analogue -> digital and back again) lattice of exhibition, performances, artist talks, workshops, demonstrations and guided studio visits all taking place at EspaceFibre’s dye studios & exhibition space. April 7 Avril: Guided artist-talk in gallery exhibition by Valérie D. Walker & Helene Brousseau. 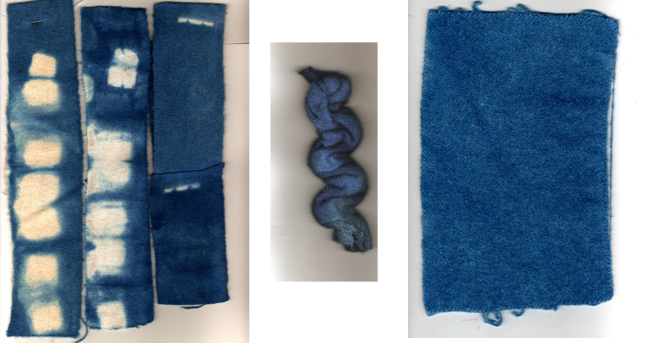 April 11 Avril 15:00 – 19:00: Demonstration of natural indigo dyeing using various resist techniques by VDW or another Indigo Collective member, dye-vat studio space open to viewers, (by donation). 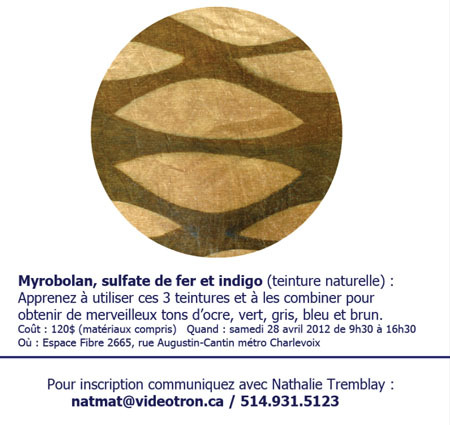 April 14 & 28 Avril, all day 9:00 – 17:00: Shibori & Indigo dyeing ateliers en Français by Nathalie Tremblay (see description). By reservation only, cost $120 (per workshop). 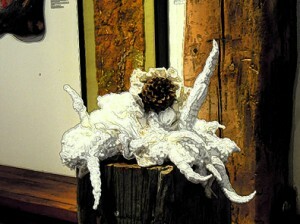 April 19 Avril, 16 – 21:00: Vernissage ou Moitissage (jeudi / Thursday) ** Exposition opens at 4pm that day! 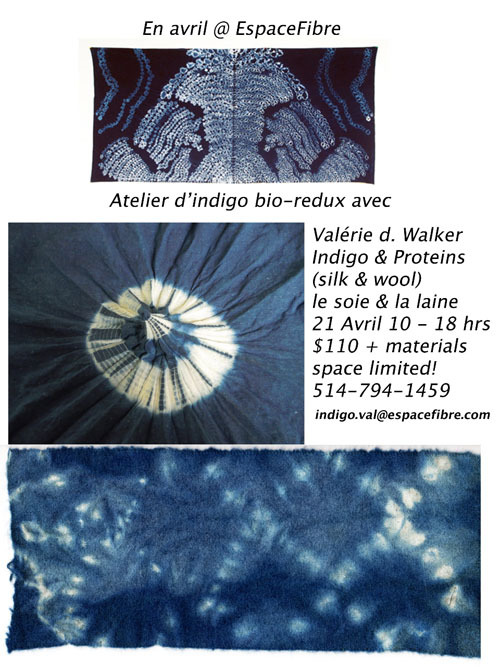 April 21 Avril, All day 10:00 – 18:00: Atelier, Natural Indigo dyeing with silk & wool given by Valérie D. Walker, bilingual (see description of workshop). By reservation only, cost $110 (plus silk&wool materials). 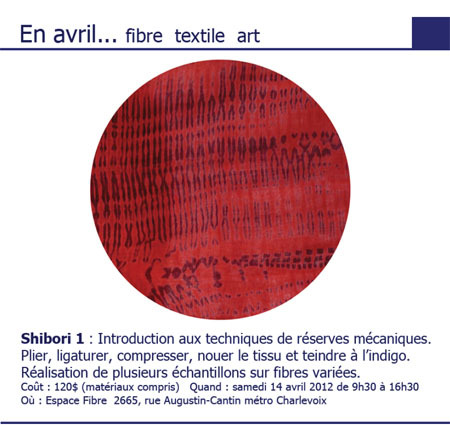 April 25 Avril (this Date still To be Confirmed) Atelier/demonstration of simple shiboro folding and indigo dyeing for elementary school children given by Art Education student. 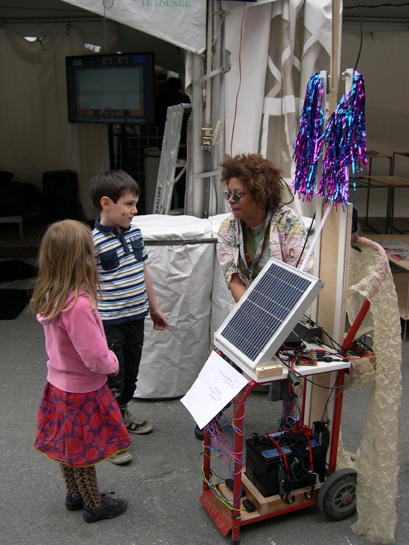 April 29 Avril: Guided artist-talk in gallery exhibition by Valérie D. Walker & participating artists. This Sunday is essentially our closing day, although we may take reservations for Monday, it’ll be back to reality after that! Regular natural dyeing workshops begin in May!! Détaille : chaque participant doivent amener 1/2 yard de laine naturel (‘Door Wool’ est préférable divisées en 3-4 pièces). Pour inscription ou information, contactez Valerie Walker, 514-794-1459 or indigo.val at gmail dot com. Surface Design Association 2011 International Conference in Minneapolis, Minnesota, USA started Tuesday 7 June 2011!!! Tuesday 7 June: 1st day: 2 Hours after landing (thanks Bal-Kaz search team!!) in MSP (Minneapolis/St.Paul), I was standing in Ceci’s lush and lovely garden! Visited the pond, baby plants, trees and territorial blackbirds drew a line in the lawn! 103F/39C heat ahhh! 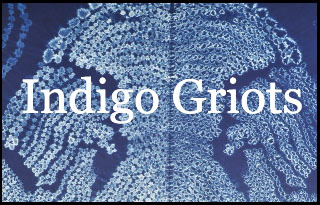 Weds 8 June: 2nd day of Indigo Griots – Tales in Making an indigo vat celebrated with Cecile Margaret Lewis. Big Day of Indigo Vat preparation, discussion, education, colour samples and collection of hard wood ash from the Turtle Bread Company, great space and food visit if you’tre in Minneapolis! Collecting ash from a local business means we are able to re-use a valuable potential resource in what is considered a waste stream to the dump. Turtle says money by having their trash reduced and we cleaned up the area, triple win for them and the Indigo goddesses! Creation of Natural wood ash alkaline proceeds well thanks to lots of stored rainwater around the garden! pH 12!? That’s good Asshh! Now what is this all for? ?